Size: Adult--2 1/2" to 4 1/2"
Identification: Adults have huge wrap-around eyes, long thin bodies, and clear wings that are held out flat and perpendicular to the body when at rest. Usually dark-colored--blue, black, and even red. They are fast and acrobatic fliers. Two pairs of wings. Short, bristlelike antennae. Tail end of males looks like a grappling hook. Damselflies are similar beneficial insects, but their wings are folded on top of the body when at rest. Biology and life cycle: Nymphs have large eyes and slender, cylindrical bodies; they live among weeds and on the bottoms of ponds. They are very aggressive and feed on just about anything their size or smaller, like fish and mosquito larva. Nymphs overwinter underwater, where they hide out and feed on other small animals. They crawl up on plant stems in the spring, and the adults emerge from a split in their backs. Nymphs hatch and go through about ten molts. They are vulnerable to birds at this stage. When mature, they can outmaneuver most birds. Eggs are usually laid in water. 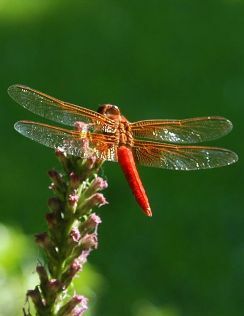 Habitat: Mostly found around ponds and boggy places that have emergent vegetation. Feeding habits: Its hunting behavior is called "hawking." They eat several flying pest insects, including house flies, gnats, and mosquitoes. They will sometimes eat old, weak, slow honeybees. Can eat as many as 300 mosquitoes a day. Insight: Another beautiful creature that adds fascination to nature. The common name devil's darning needle came about because they were supposed to be capable of stitching together the lips of wicked children in their sleep. Adults can fly up to thirty-five miles per hour. They can lift double their weight, take off backward, stop, hover, somersault, and do other impressive acrobatics. They are the most advanced fliers in the animal kingdom.